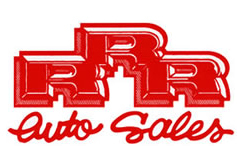 Welcome to RRR Auto Sales, Inc.
Click on "About Us" to learn more. Browse our site using the above links to see photos, mileage, and price for each vehicle. If you don't see what you are looking for, try our "Vehicle Inquiry Form" located under "Contact Info." Feel free to drive down to check out our inventory in person. ALL vehicles have tags in the windows stating the year, options, mileage, and most importantly.... PRICE! Sick of shopping for a vehicle without knowing how many miles are on it or what the price is? At RRR, it is all provided for you on an easy to read window tag. No high pressure sales. The owners Lou and Rachael are there to help provide a smooth stress free shopping experience. Thanks for stopping by!